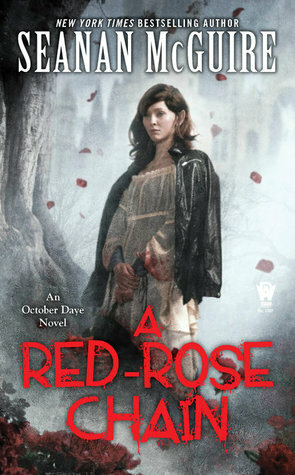 I just finished the latest October Daye story from Seanan McGuire, A Red-Rose Chain. Literally just finished as I set down my Kindle and came to pop out a review. This book is so, so new (less than two weeks now), that I’m going to give a bare-bones description but please be warned that there could be SPOILERS here. So, we start out with Toby and company fighting off a pack of Mauthe Doog, giant black dogs from the depths of Faerie that had been locked away by Oberon centuries ago. I’m still hoping that McGuire will get Toby to find out why Oberon sealed off much of Faerie so long ago. I think it would be fascinating. She figures out that these dogs aren’t evil creatures. They’re frightened. They haven’t seen the mortal world in centuries or longer and to be suddenly dumped out in modern San Francisco scared the crap out of them. Scared animals will fight back, so naturally, they’d caused a dust up. And because she’s a hero of the realm, Queen Arden of the Mists called in Toby for help. Once they Mauthe Doogs are taken care of, the next catastrophe rears its ugly head pretty immediately. Like, within 2-3 hours immediately. The Kingdom of Silences to the north has declared war on the Mists because, though Queen Arden is confirmed as the rightful ruler and heir of the prior king, Gilad Windermere, the deposed queen had run straight to Silences and the puppet she’d put on the throne. Arden sends Toby as her chosen diplomat to Silences in hopes of averting a war. Which, given Toby’s experience is probably not the best course of action but Toby touched the queen without permission (a major taboo in the fae world). So this post is punishment essentially. With her are new fiancee and King of Dreaming Cats (I believe is the kingdom’s name) Tybalt, squire Quentin and former Fetch May. Let’s face it, May is around because 1) she’s hard to kill and 2) she’s the only person who has a hope in hell of making Toby presentable to royalty. Together, they have three days to try and talk Silences out of their ridiculous war or there will be hell to pay. I won’t say more because otherwise we get into major plot points and I don’t want to ruin it. It’s a delicious book that took me about four hours to plow through total (stretched over a few lunch breaks). I love the October Daye novels. All of them. There hasn’t really been a bad one, though some of them are definitely better than others. I think at one point in time Amazon had this listed of book 9 of 9 of the series, so I’d gone into this a bit sad, expecting a grand wrap up.